Pokhara University (PU) is all set to held its 15th convocation ceremony. The grand ceremony is going to held on 2074 Falgun 08 (20th February 2018). Application forms for the 15th PU convocation 2074 is now available from its website. Eligible students can download PU convocation form from the official website of PU or can get forms from PU offices Dhungepatan, Pokhara and Ratopul, Kathmandu.The application form opens from 31 Dec 2017 and deadline to submit application form is 2nd February 2017. 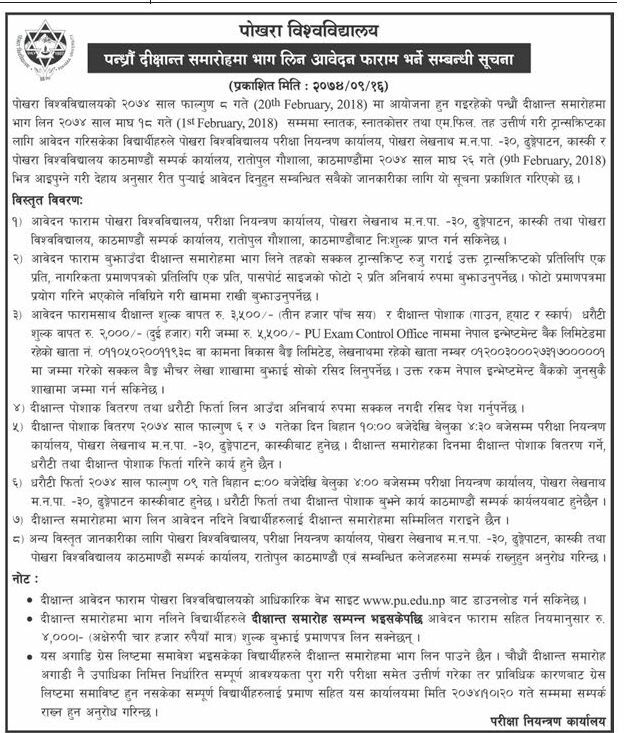 Students who have passed Bachelor's and Master's from Pokhara University affiliated colleges by 2074 Magh 18 (1st February 2017) and have applied for transcript can apply from Pokhara University examination controller office, Dhungepatan, Lekhnath and Pokhara University Contact office, Ratopul, Gaushala within 2074 Magh 26 (9th February 2018).